Good morning, my DIY lovelies! It is makeover time at Cutting Edge Stencils and today we’re going to be taking a look at transforming a master bathroom on a small budget. A bathroom makeover doesn’t have to break your bank account. Sometimes all it takes is a little bit of paint and one of our stencils to give it a whole new look. Let’s take a look at a master bathroom makeover using one of our popular geometric stencils, the Fuji Allover Stencil. We’d like to welcome back our pal Ashley, the creative DIYer behind the blog Domestic Imperfection. 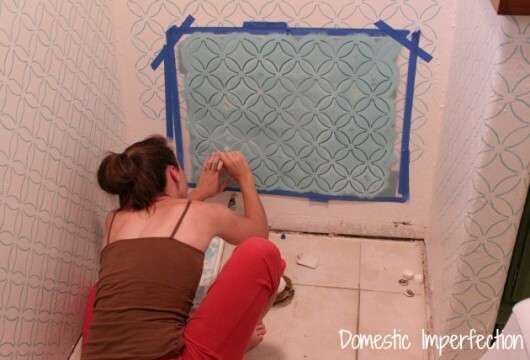 Ashley has been slowly working on a master bathroom makeover with one DIY project at a time. 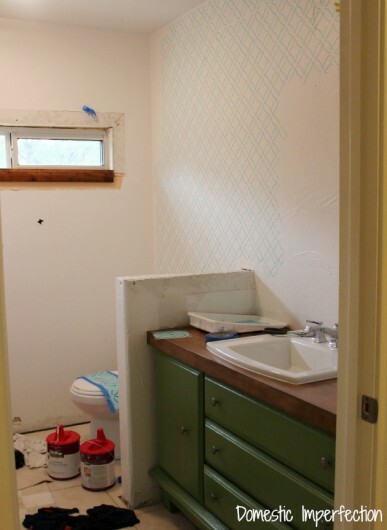 Here is what her master bathroom looked like when she purchased the home. 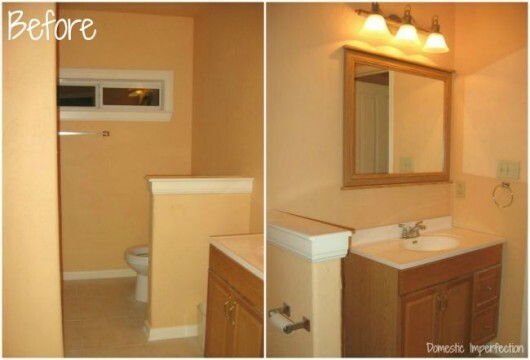 Painted in builder beige, it was no wonder that Ashley wanted to give it a makeover! She was on a tight budget for this makeover project and needed to make sure every penny was spent wisely. Rather than purchase a pricey wallpaper for the bathroom, she chose to use a wall stencil. Stencils are a great alternative to wallpaper because they are easy to apply, can be customized to the space, and inexpensive! 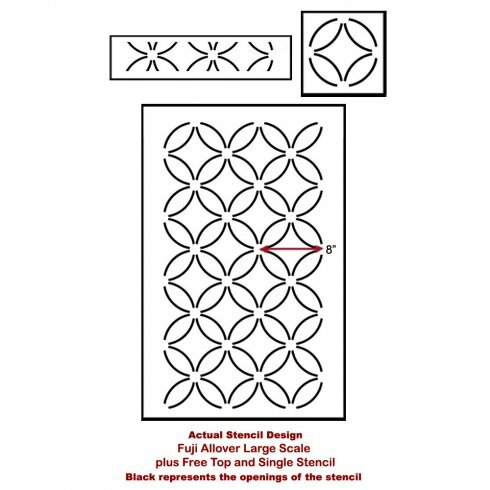 Ashley selected the the Fuji Allover Stencil, a Japanese inspired pattern. With our Fuji Allover Stencil pattern in hand, Ashley was ready to go. First she painted the bathroom white. 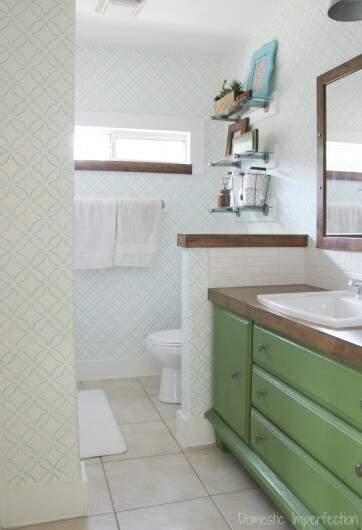 She commented, “It’s a fairly small and dark bathroom, so I painted it white to brighten it up and then stenciled it with a subtle turquoise design.” Ashley stenciled the Japanese-inspired pattern in Behr’s Pure Turquoise. She used painters tape to hold the pattern in place and painted it using a stencil brush. After all the stenciling was complete, Ashley added her decor elements. She organized the pantry and added industrial shelving and fixtures, a magazine rack, and decor. 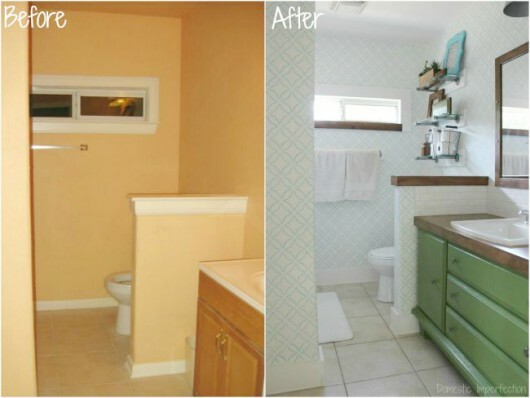 You can read all about her budget friendly bathroom projects on her blog, Domestic Imperfection. Ready to see how it all turned out? Here is Ashley’s stenciled master bathroom. 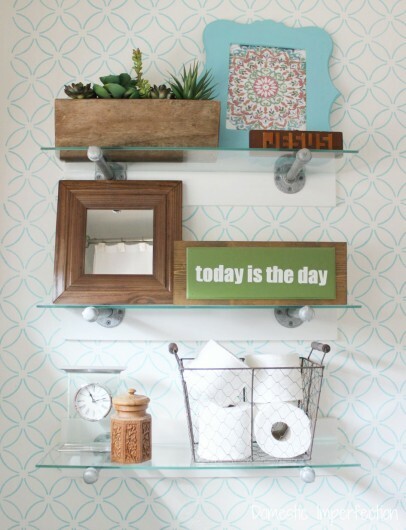 Doesn’t the Fuji Allover Stencil look so pretty in this space? We think so! Oh, and because we can’t resist sharing a great before and after photo! Here is the before and after comparison. Great job, Ashley! 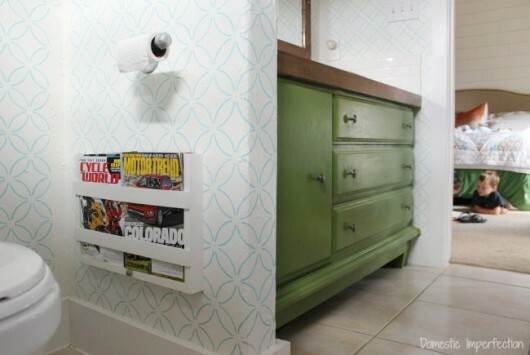 Tell us, what do you think of this stenciled bathroom makeover? Leave us your thoughts in the comments below! 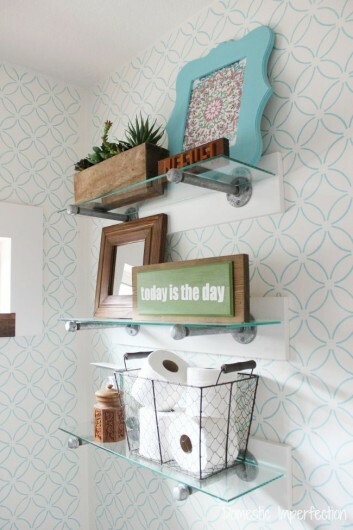 Buy a stencil and glam up your master bathroom! How to Stencil Kitchen Chairs and a Giveaway!